Through the first half of 2014, Massachusetts single-family home sales declined 1.8 percent, according to The Warren Group, publisher of Banker & Tradesman; however, the median price through June 2014 increased 4.7 percent. From January through June 2014, the number of single-family homes sold statewide declined to 21,272 single-family home sales compared to 21,662 homes sold during the same six-month period last year. Second quarter home sales totaled 13,707, a 1.5 percent decrease from the 13,917 properties sold in the second quarter of 2013. Low inventory, especially earlier in the year, contributed to the decrease in home sales. Single-family home sales increased 3.7 percent in June, the first year-over-year increase since January 2014. A total of 5,795 single-family homes were sold, an increase from 5,589 properties sold in June 2013. June marked the highest number of single-family home sales for the month of June since June 2006 when there were 6,152 transactions. The median sales price of Massachusetts homes increased by 2.8 percent to $359,900 in June compared with $350,000 in June 2013. From January through June, the median price increased to $329,900, up from $315,000 during the same six-month period last year. During the second quarter, median prices increased 3 percent to $340,000, up from $330,000 during the second quarter of 2013. 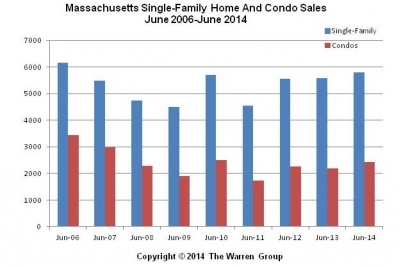 Massachusetts condominium sales increased in June by more than 11 percent from June 2013. A total of 2,429 condos sold in June compared with 2,187 sold in June 2013. Through June, condo sales increased 9.7 percent to 9,592 compared to 8,744 during the first two quarters of 2013. Condo sales for the second quarter increased 8.4 percent. In the second quarter, 6,172 condos sold compared to 5,695 units sold during the same period in 2013. The median price of a condo sold in June rose 1.6 percent to $325,000. The median price in June 2013 was $320,000. Through June, the median selling price for a condominium in the Bay State stood at $310,000, an increase of 8.7 percent from $285,000 during the first six months of 2013. From April through June, the median condo price rose 6 percent to $320,000 from $302,000 in the second quarter of 2013.